Ruck, Lindsay. "Violet King". The Canadian Encyclopedia, 11 October 2018, Historica Canada. https://www.thecanadianencyclopedia.ca/en/article/violet-king. Accessed 25 April 2019. Violet Pauline King Henry, lawyer (born 18 October 1929 in Calgary, AB; died 30 March 1982 in New York, NY). King was the descendant of Black settlers from the United States. Her life consisted of several important milestones. She was the first Black Canadian to obtain a law degree in Alberta, the first Black person admitted to the Alberta Bar and the first Black woman to become a lawyer in Canada. She was also the first woman appointed to an executive position with the YMCA in the United States. Violet King, the first Black woman admitted to the Alberta Bar, and to practise law in Canada. E.J. McCormick, with whom she articled, shakes her hand, 2 June 1954. Violet King was born 18 October 1929 in Calgary, Alberta. Her paternal grandparents moved to Keystone (now Breton), Alberta, from Oklahoma in 1911. They were drawn to Canada after discovering the federal government’s campaign to entice American farmers to immigrate to the country. However, the Canadian government didn’t expect Black farmers to also answer this call. The government quickly moved towards discouraging Black immigration and thus limited the total number of Black immigrants to the Canadian Prairies to only about 1,000 by 1912 (see Order-in-Council P.C. 1911-1324 — the Proposed Ban on Black Immigration to Canada). King’s parents, John and Stella, moved to Calgary in 1919 and lived in the community of Hillhurst-Sunnyside. John worked as a sleeping car porter with the Canadian Pacific Railway and Stella worked as a seamstress. They had four children together, Violet, Vern, Lucille and Ted, who launched a legal challenge against a Calgary motel’s discriminatory policy in 1959. Violet King’s brother Ted was the president of the Alberta Association for the Advancement of Coloured People (1958-61). In 1959, Ted King launched a legal challenge against a Calgary motel’s discriminatory policy, decades before human rights protections existed throughout Canada. The case made it to the Alberta Supreme Court. Though it was not successful, King’s case exposed legal loopholes innkeepers could exploit in order to deny lodging to Black patrons. Ted King, centre, is met by his parents on his return to Calgary, Alberta. 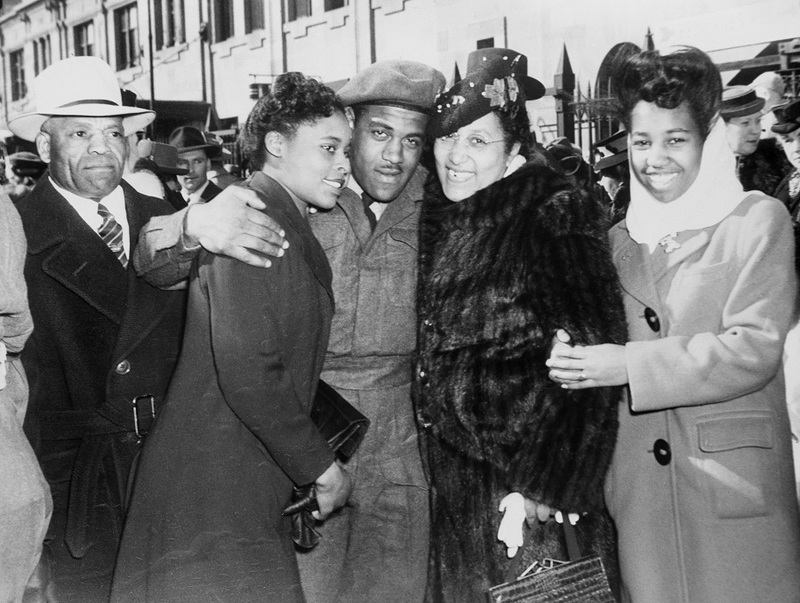 From left to right: John King, Della Mayes, Ted King, Stella King, and Violet King. Photo dated 21 March 1946. Violet King attended the University of Alberta in 1948. To finance her studies, she taught piano lessons in Edmonton. Out of 142 students, King was one of only three women in the Faculty of Law. She was a member of the Blue Stocking Club — a discussion group for women with an emphasis on history and public affairs. The club was likely inspired by the Blue Stockings Society, an informal group of intellectual women who discussed timely topics and issues in 18th-century England. She was vice-president of the students’ union and representative of the students’ union to the National Federation of Canadian University Students. In 1951-52, during her undergraduate studies, King was selected as class historian and served as the 1952 Alberta representative to the International Student Services Conference held in Hamilton, Ontario. That same year, King was one of four students to receive an Executive “A” gold ring during Colour Night, an annual event to celebrate students’ contributions to the University of Alberta. The other three students to receive the honour were Peter Lougheed, the future premier of Alberta (1971–85), Ivan Head, advisor to Pierre Trudeau, and Garth Fryett, a prominent Edmonton lawyer. King obtained a bachelor of arts degree in 1952 and received her LLB degree in 1953. She was the first Black person to graduate from law school in Alberta and the only woman in her graduating class (see Women and the Law). Following graduation, Violet King articled in the Calgary firm of Edward J. McCormick, QC, a well-known criminal trial lawyer (see Criminal Law). King later recalled working on five murder trials during her year articling with McCormick, a substantial caseload. 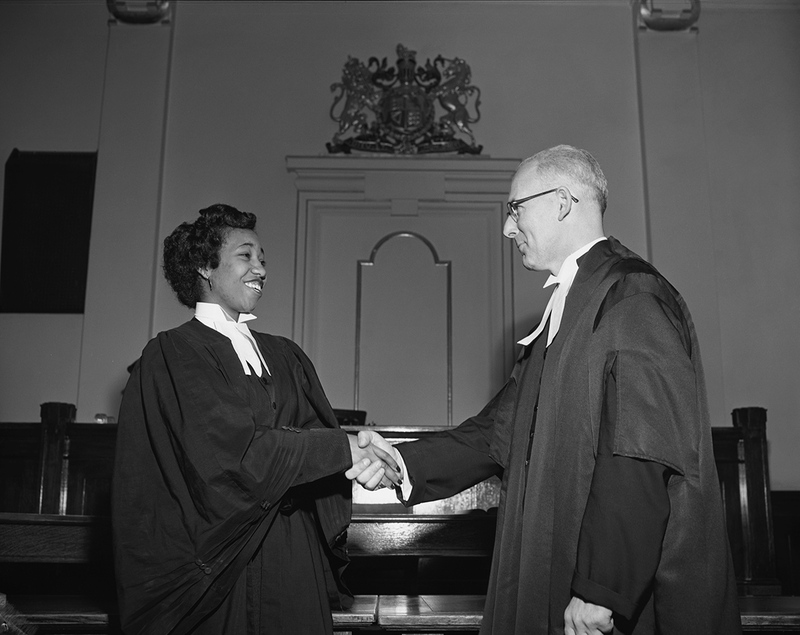 King was called to the Alberta Bar on 2 June 1954 and became the first Black female lawyer to practise law in Canada. Her admission made headlines in several local newspapers. Two Calgary publications described it as a milestone in Canadian history. (It was not until nearly 10 years later that Lionel Jones was admitted to the Alberta Bar in 1963 — the second Black lawyer in the province.) King was also treasurer for a local labour union, the Calgary Brotherhood Council. Just after being called to the Bar, the International Brotherhood of Sleeping Car Porters and Maids, the first labour union organized by African-Americans to be affiliated with the American Federation of Labor, recognized her achievements (see also Sleeping Car Porters in Canada). The president and a vice-president travelled from New York and Detroit to make a presentation to King in Calgary. 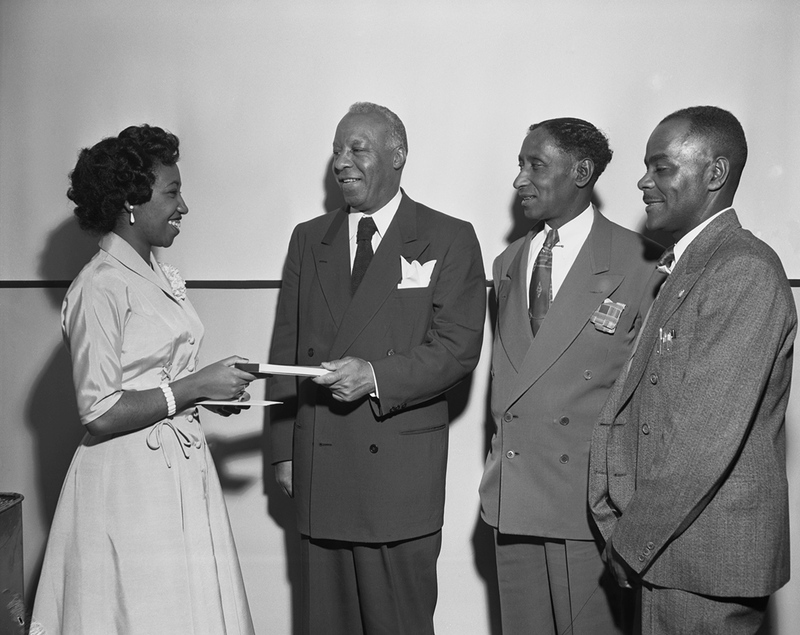 Violet King presented with a purse by the Calgary local of the International Brotherhood of Sleeping Car Porters (IBSCP), June 1954. Left to right: King, Philip Randolph (president of the IBSCP), Bennie Smith (second vice-president of the IBSCP) and Roy Williams. Railway porters took care of passengers on trains. This was one of the few occupations available to Black Canadian men from the 1870s to the First World War. Black porters had to fight to form their own union, The Brotherhood of Sleeping Car Porters, after being denied representation by the White union. Violet King’s father and brother Ted both worked as porters. King practised law in Calgary for several years. She worked at a firm headed by A.M. (Milt) Harradence, QC, a Canadian criminal lawyer and later a judge of the Court of Appeal of Alberta (see Courts of Law in Canada). King spoke publicly about racism in the workplace at least once. 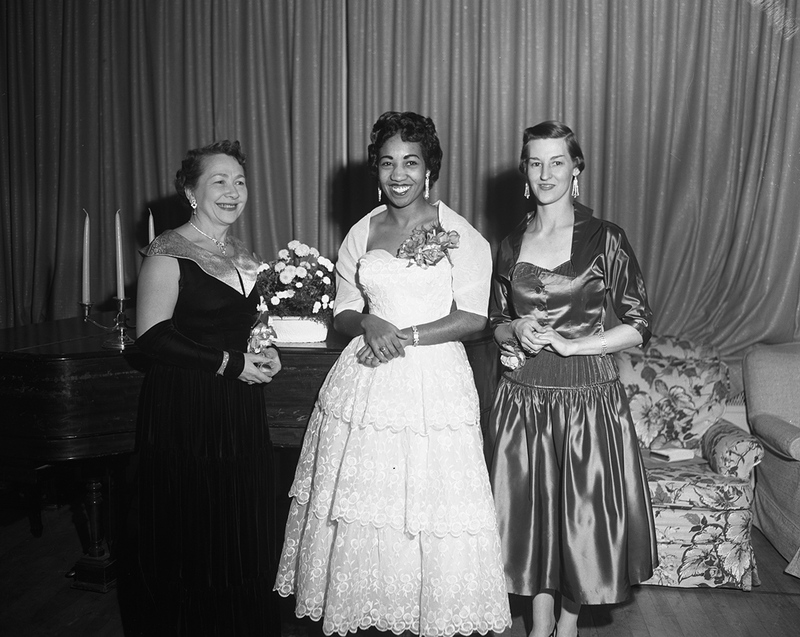 In a speech delivered at the Beta Sigma Phi sorority banquet in Calgary, in November 1955, she remarked, “It is too bad that a Japanese, Chinese or colored girl has to outshine others to secure a position.” She also described the challenges women had faced in the work force to that point, and expressed hope that in future greater focus would be placed on a person’s ability and less on one’s race or gender (see Prejudice and Discrimination). Violet King was guest speaker at the Beta Sigma Phi pledge banquet in November 1955. King eventually moved to Ottawa to work with the federal department of Citizenship and Immigration (see Citizenship). Her role with the department included travelling the country to meet with leaders of different service and community organizations. To take on this role, in April 1956, she changed her status to become a non-practising member of the Law Society of Alberta. King worked in the department for seven years; her roles included executive assistant to the chief of the Liaison Branch of Canadian Citizenship and Immigration, and directing programs with the Canadian Citizenship Council. Ellen Fairclough, the first woman appointed to a federal Cabinet	position in Canada, was Minister of Citizenship and Immigration from 1958 to 1962. In 1963, King moved to New Jersey to become executive director of the Newark YMCA’s Community Branch. This role involved assisting Black applicants who were actively seeking employment opportunities. In 1965, King married Godfrey C. Henry, who later received an MA in Political Science from Columbia University and a Law degree from Rutgers. In 1966, the couple gave birth to their only child, Jo-Anne Henry. In 1969, King moved to Chicago to become director of planning, and later became director of manpower, planning and staff development with the YMCA. In 1976, she was appointed executive director of the National Council of YMCA’s Organizational Development Group, making her the first woman named to an executive position with the national organization. King passed away from cancer in New York, NY. She died 30 March 1982, at age 52. King shattered glass ceilings and broke down colour barriers to pave the way for future generations. Her hard work and drive to excel in all facets of her career are an inspiration for those who also aspire to do great things in their field. In 1998, King was inducted to the National YMCA Hall of Fame.